Suite 330, Aurora, CO 80045. There is a patient parking lot adjacent to the building. Exit the parking garage to the west. Once you reach the main lobby doors, take the elevator to the third floor. The entrance to Suite 330 is immediately south of the elevators. Exit on 17th Avenue heading west. Turn right at the first stoplight (about 1 block) on Potomac Street/Fitzsimons Parkway. Follow Fitzsimons Parkway north until you reach Montview Boulevard – turn left. Turn right onto Victor Street and the parking garage is on your immediate left. Take Colfax Avenue east to Peoria Street – turn left onto Peoria (north). Follow Peoria Street to Montview Boulevard and turn right. Follow Montview Boulevard to Victor Street. Turn left onto Victor Street and the parking garage is on your immediate left. 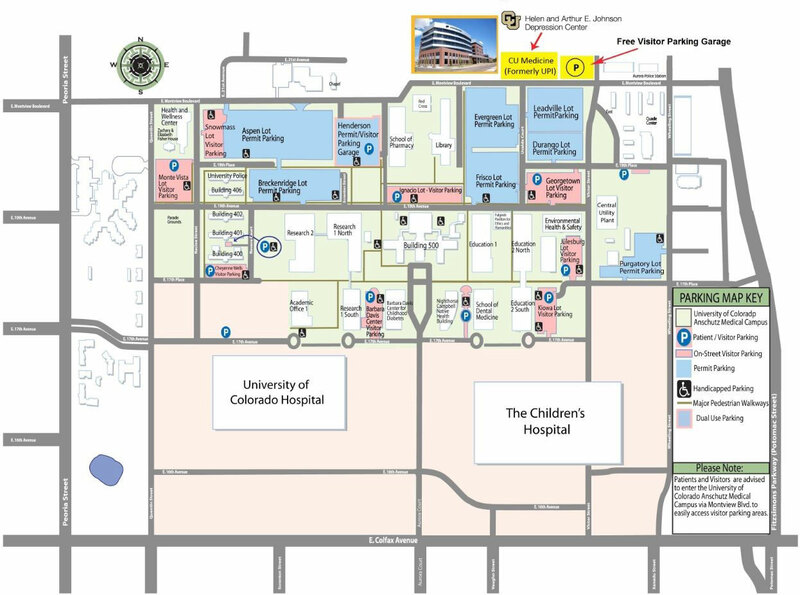 Located at the University of Colorado Anschutz Medical Campus, the Johnson Depression Center is a supportive environment for patients and families that incorporates current research on the impact of the built clinical environment on patient outcomes. We believe that patients and families seeking help for depression, mood and anxiety disorders deserve to be seen in a setting that is beautiful and calming.